Hercules. A radio galaxy hosted in a massive elliptical galaxy. Radio emission, overplotted on the optical image, is shown in pink highlighting large jet-lobe structure. A Milky Way-sized spiral galaxy is marked by white ellipse. Image adapted from a Hubble Heritage Release. Credit: NASA, ESA, S. Baum and C. O’Dea (RIT), R. Perley and W. Cotton (NRAO/AUI/NSF), and the Hubble Heritage Team (STScI/AURA). Few know exactly what radio galaxies are, much less what factors influence their formation. Even so, new discoveries have brought these astronomical structures into the public eye, and researchers continue to investigate the mysterious conditions of their existence. Below, Veeresh Singh addresses the substance and implications of such discoveries, further elaborating on his research paper, Discovery of rare double-lobe radio galaxies hosted in spiral galaxies, recently published in Monthly Notices of Royal Astronomical Society. A galaxy is a gigantic system possessing billions of stars, vast amounts of gas, dust, and dark matter held together by gravitational attraction. The typical size of galaxies can be anywhere from a few tens-of-thousands to a few hundreds-of-thousands of light-years. Our own solar system is part of a galaxy named the “Milky Way.” Observations made from telescopes have shown that our universe is full of billions of galaxies that are of different shapes (e.g., spiral, spheroidal, elliptical and irregular). Studies on the motion of stars, gas, and dust close to the core of galaxies reveal that almost all galaxies host Super Massive Black Holes(SMBHs), which are millions to billions of times the mass of our Sun in their centres. In simple words, black holes are gravitationally collapsed systems in which gravity is so strong that even light cannot escape from the surface of their sphere of influence. Whenever matter is available in the vicinity of SMBHs, they accrete matter via gravitational pull and also eject a fraction of accreted matter—through outflowing bipolar collimated jets formed via magneto-hydro-dynamical processes. Galaxies having accreting SMBH are called “active galaxies.” Some of these active galaxies exhibit radio-emitting overflowing jets extending well beyond the size of host galaxies’ stellar distribution. These active galaxies are called “radio galaxies.” As the name itself suggests, radio galaxies are powerful emitters of radio emissions and show radio morphology that consists of a core producing a pair of bipolar collimated jets terminating in two lobes. The radio core coincides with the centre of the host galaxy seen in optical light but the jet-lobe extends well-beyond the host galaxy and entrenches into the empty space between galaxies, i.e. “intergalactic region.” Radio galaxies are one of the largest structures in the Universe and the total end-to-end radio size can range from thousands to millions of light years. What is the shape of hosts of radio galaxies? Traditionally, radio galaxies are found to be hosted in massive, gas-poor elliptical galaxies characterised by feeble star formation rates. It is believed that the relativistic jets emanating from the accreting SMBHs at their centres can easily plough through the rarer InterStellar Medium (ISM) of elliptical galaxies and reach scales of up to millions of light years. How common are spiral-host radio galaxies? Unlike conventional radio galaxies, which are almost always found in elliptical galaxies, we have discovered four radio galaxies (named in astronomical parlance as J0836+0532, J1159+5820, J1352+3126, and J1649+2635) that are found to be hosted in spiral galaxies. These extremely rare and enigmatic galaxies were found in a systematic search that combined a whopping 187,000 optical images of spiral galaxies from the Sloan Digital Sky Survey (SDSS) DR7 with the radio-emitting sources from two radio-surveys viz. ‘Faint Images of the Radio Sky at Twenty-cm (FIRST)’ and ‘NRAO VLA Sky Survey (NVSS)’ both carried out with the Very Large Array (VLA) radio telescope in the United States. This is the first attempt to carry out an extensive systematic search to find spiral-host radio galaxies using largest existing sky surveys. Before this work, only four examples of spiral-host radio galaxies were known and three of these were discovered serendipitously. What causes spiral galaxies to become radio-loud? Understanding the formation of these newly discovered spiral-host radio galaxies is a challenge in the present theoretical model. Using current available data on these sources it is speculated that the formation of spiral-host double-lobe radio galaxies can be attributed to more than one factor, such as the occurrence of strong interactions or mergers with other galaxies, and the presence of an unusually massive SMBH, while keeping the spiral structures intact. Notably, all these galaxies contain an SMBH at their centre with a mass of approximately a billion times that of the Sun. J083+0532, a spiral galaxy with million-light-years large radio emitting jet-lobe structure. 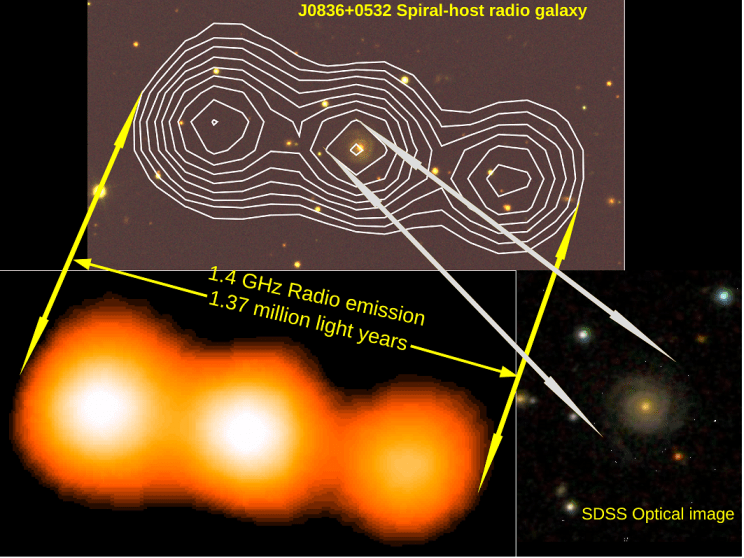 Upper panel shows contours of radio emission overplotted on the optical image from Sloane Digital Sky Survey (SDSS). Lower left panel represents the false colour radio image while lower right panel shows SDSS optical image. Image used with permission. Since only one among four was found in a cluster environment, it implies that the large scale environment is not the prime reason for triggering radio emission. Mergers or interactions could be more likely. In fact, two galaxies—J1159+5820 and J1352+3126—in this study show evidence of mergers. However, another two galaxies—J0836+0532 and J1649+2635—are face-on spirals and do not show any detectable signature of disturbance caused by a recent merger with another galaxy. How are galaxies currently being studied? In order to attain a better understanding of the formation of these galaxies, the research team is observing these galaxies at different frequencies. The team has already acquired low frequency radio observations with the Giant Metrewave Radio Telescope (GMRT) in India. The multi-frequency radio observations will enable the study of the radio structures at different spatial scales and also in estimating the time elapsed since the radio emitting jets were ejected from the centre of each galaxy. What does the discovery of spiral-host radio galaxies mean to upcoming surveys? The discovery of these spiral-host radio galaxies can be considered as a test bed to find rare populations of spiral-host double-lobe radio galaxies in the distant universe using more sensitive surveys from upcoming facilities such as the Large Synoptic Survey Telescope (LSST) and the Square Kilometre Array (SKA). 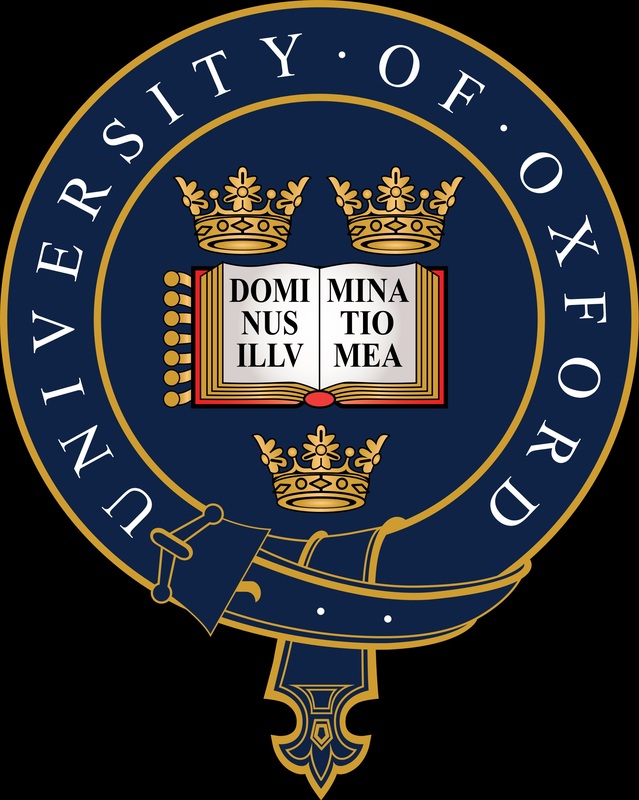 Oxford is a collegiate university, consisting of the central University and colleges. The central University is composed of academic departments and research centres, administrative departments, libraries and museums. The 38 colleges are self-governing and financially independent institutions, which are related to the central University in a federal system. There are also six permanent private halls, which were founded by different Christian denominations and which still retain their Christian character. 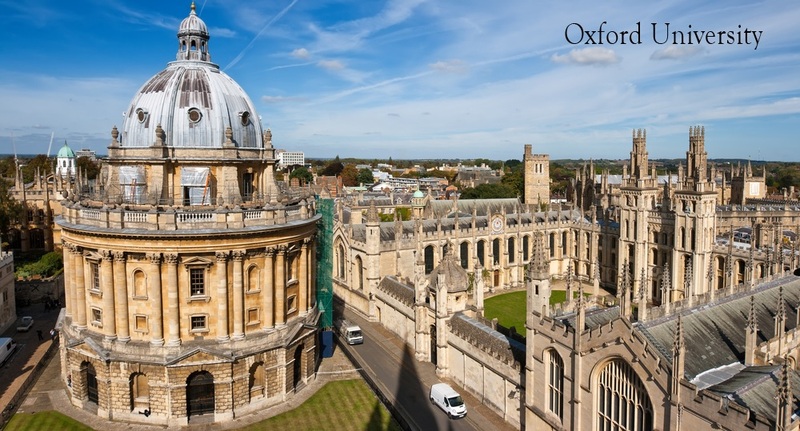 The different roles of the colleges and the University have evolved over time.